It is also known by Suri people inhabit the region spanning from the western edges of Omo National Park, over the headwaters of the Kibish River, and into the hills around Maji. The whole nation numbers around 40,000 and their language belongs to the East Sudanic branch of Nilo-Saharan language family. The Surma comprise three sub groups: the Chai, the Tirma and the Bale. The first two groups live in the lowlands around the Kibish River, and the latter inhabits the hills around Maji, extending to the Akobo River and into the Sudan. These three groups hunt in Omo National Park, dig for alluvial gold and build beehives to attract wild bees. Surma women, like their Mursi counterparts, wear lip plates made of clay. Surma men are similar to the Mursi in their practice of stick fighting, referred to as “donga.” In preparation for these fierce battles, the men mix chalk and water into a full-body wash that gives them a frightening, ghostly white appearance designed to intimidate opponents. During the fight the men advance, retreat and battle using long staffs. The traditional enemies of the Surma are the Bumi to the south; fights between these neighbors still occur with some frequency. 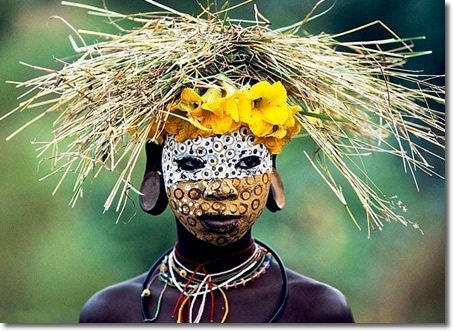 Their main practice is lip plate made famous by anthropologists, old photos and recent National Geographic magazines, the custom of wearing lip plates is one of the distinct features of the women of the Surma and Mursi tribes in southern Ethiopia. At an early age, a small incision is made into the girl’s bottom lip, using a small knife, the front teeth of the lower jaw are removed, and a disc of locally derived baked clay is inserted into the incision. As the girl ages, and the bottom lip stretches with the weight of the plate, the smaller discs are removed and replaced with ever larger discs, further stretching the lip until it becomes so distended that, as observed in some Surma women, the lip (with the plate removed) can sometimes be pulled right over the head. The discs are removed at mealtimes to allow for eating and drinking.